Fan Blamed For Chicago Cubs' Loss Gets His Own World Series Ring : The Two-Way "I am happy to be reunited with the Cubs family and positively moving forward with my life," Steve Bartman said after receiving the ring. On Monday the Chicago Cubs gave a 2016 World Series championship ring to Steve Bartman, a fan blamed for a team loss in 2003. A year after the Chicago Cubs won their first World Series title in more than a century, a long-suffering fan is getting another reward. Steve Bartman was handed a personalized 2016 World Series ring, after being blamed for costing the team the title 13 years earlier. It began with a simple gesture, perhaps an instinctive one on Oct. 14, 2003. The Cubs were ahead, 3-0, in Game 6 of the National League Championship Series against the Marlins in the eighth inning. A foul ball headed Bartman's way. He — and other fans — reached out for it, but it was Bartman who deflected it from the outstretched mitt of left fielder Moises Alou. Watch the move in the video below. The Marlins wound up scoring eight runs in the remainder of the inning. They won the game, then the series. The umpire determined it was fair game on Bartman's part because he didn't reach beyond the stands. It would have counted as interference if he had extended his arm out over the field, which would have resulted in the ball being declared dead, according to major league rules. No one can say how things would have gone if Bartman hadn't touched the ball. But angry Cubs fans didn't care. Bartman had to be hidden inside the stadium after some started hurling abuse at him. Then he had to wear a disguise before being escorted out of Wrigley Field, reports The New York Times. He stayed out of the public eye for the next 14 years. A friend and spokesman told CNN in 2016 that Bartman had been offered book proposals and hefty sums for a commercial, but he turned them all down. And he continued to receive threats, according his spokesman. 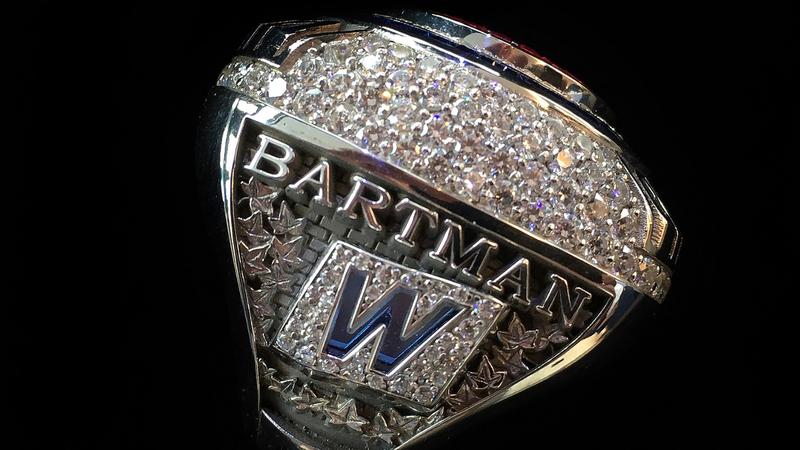 On Monday, Bartman came to the office of Cubs owner Tom Ricketts to receive the ring, reports WGN-TV. "We hope this provides closure on an unfortunate chapter of the story that has perpetuated throughout our quest to win a long-awaited World Series," the team said in a statement. "While no gesture can fully lift the public burden he has endured for more than a decade, we felt it was important Steve knows he has been and continues to be fully embraced by this organization." And now Bartman has spoken out. "Although I do not consider myself worthy of such an honor, I am deeply moved and sincerely grateful to receive an official Chicago Cubs 2016 World Series Championship ring," he said in a statement. "I am fully aware of the historical significance and appreciate the symbolism the ring represents on multiple levels." The reaction on Twitter appeared to be mostly positive, with fans applauding the move. "I am happy to be reunited with the Cubs family and positively moving forward with my life," Bartman said.